"This recipe yields a crust that is soft and doughy on the inside and slightly crusty on the outside. 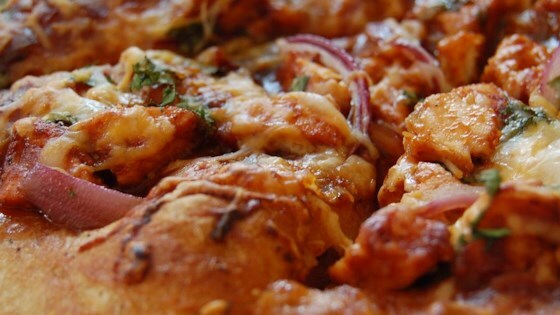 Cover it with your favorite sauce and topping to make a delicious pizza." Stir the salt and oil into the yeast solution. Mix in 2 1/2 cups of the flour. Turn dough out onto a clean, well floured surface, and knead in more flour until the dough is no longer sticky. Place the dough into a well oiled bowl, and cover with a cloth. Let the dough rise until double; this should take about 1 hour. Punch down the dough, and form a tight ball. Allow the dough to relax for a minute before rolling out. Use for your favorite pizza recipe. You’re going to love this 5-star recipe for homemade pizza crust. Pretty darn good! If you aren't baking on a pizza stone, you should pre-bake it a little before putting on toppings or the middle will be under-done.